Two doubly terminated parallel crystals, a little bit more brilliant than the others. The most esthetic specimen form of this find in our opinion. 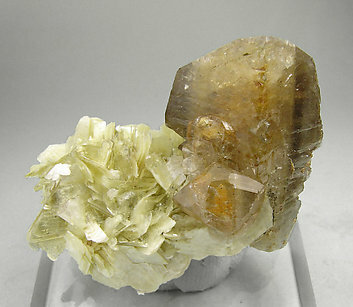 White Albite on its rear and on its bottom. Bottom of the crystals are recrystallized. 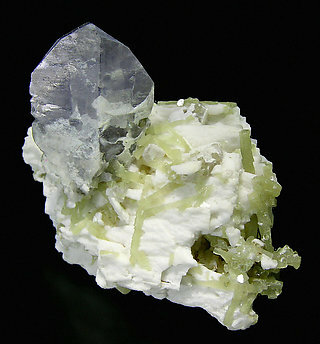 White Albite on its left hand corner and with the typical luster, partial transparency and sharp form of the best specimens from this find. A rarity. 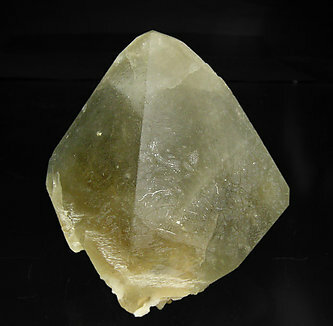 The crystal, even though it is not well terminated on the rear, is well developed and is quite large for the locality, which in turn is a classic one for US mineralogy. It is a floater. 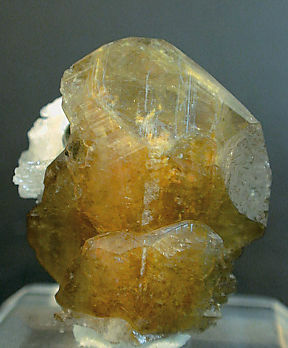 Complete crystal with very well defined faces and edges, translucent, of greenish-yellow color and having a very well marked twin. The crystal is on a thin matrix of pinkish Orthoclase. Of excellent quality for the species. One of the novelties of Munich this year. 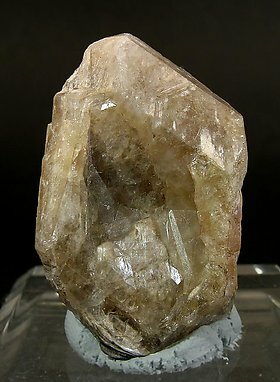 Crystals are dipyramidal, have very well defined faces and edges, a considerable size, an attractive yellowish color, an excellent luster and are partially covered by a matrix of small Albite crystals. This specimen was photographed and published as a novelty at the 2007 Munich Show in the magazine ‘Le Règne Minéral’ number 78, page 37. 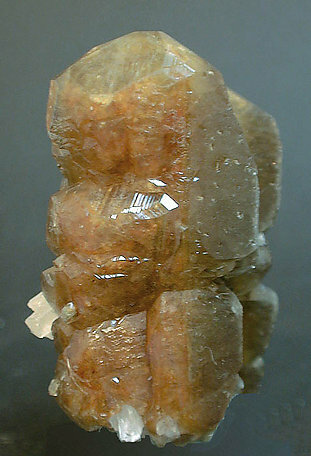 Doubly terminated crystals, one of them clearly dominant, with lateral parallel growths, good luster and yellow-brown color, on a matrix of laminar crystals of Muscovite. 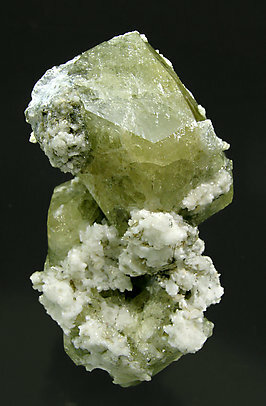 Doubly terminated crystal of very well defined faces and edges, on a matrix of Albite partially covered by thin prismatic, yellowish-green crystals of Muscovite. Curiously the faces of the crystal are brighter on the back, which is not clearly shown in the picture. The color is excellent.